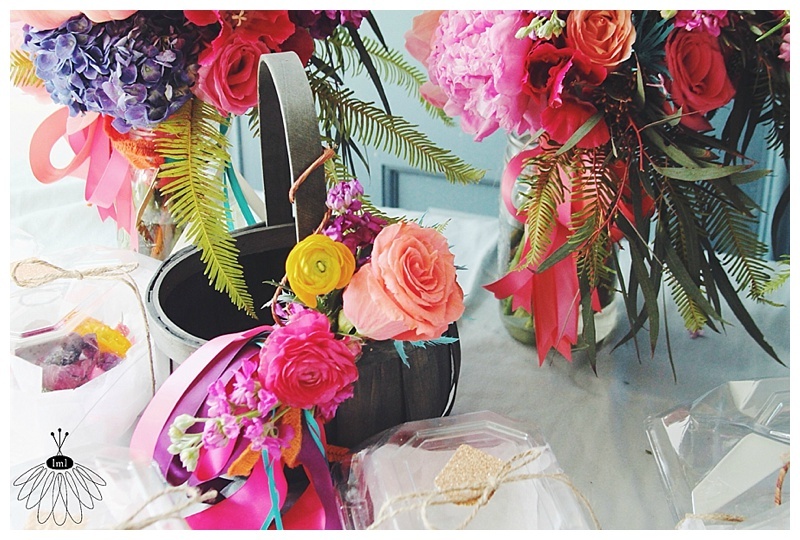 The most complimentary words you can say to a florist are, "I trust you." 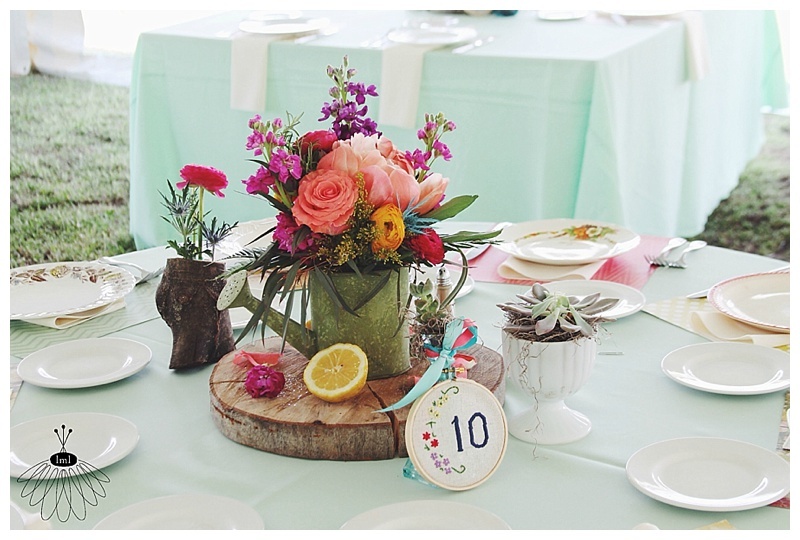 When Julia explained to me that her wedding colors were purple, pink, mint, coral, orange, teal, and yellow... I knew that her free-spirited style was the same as mine and that I could, for sure, be trusted to capture her style perfectly. The bride, her bridesmaids, her family & her friend's families collected mis-matched tins, tea canisters, milk glass bud vases, vintage crystal, china & wooden crates for me to fill with flowers. The results were spectacular! 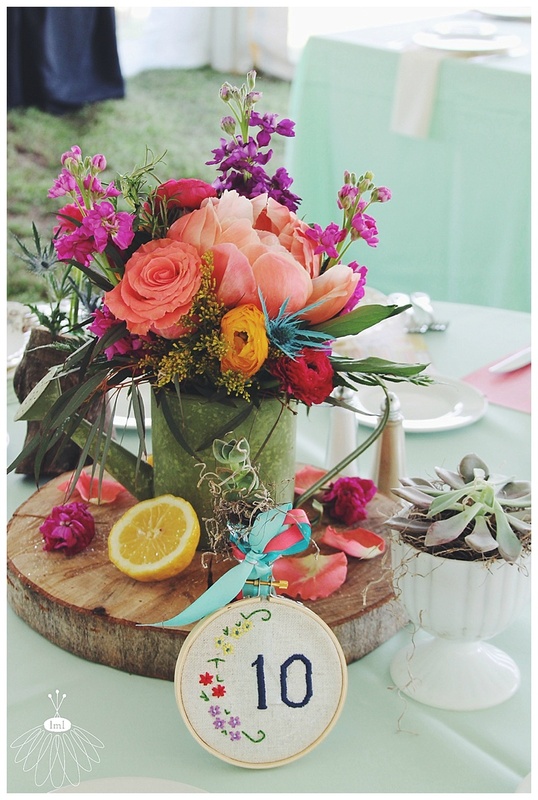 I love the rustic, vintage clusters filled with the most colorful and rich flowers I have every had my hands on. Read on for more details... 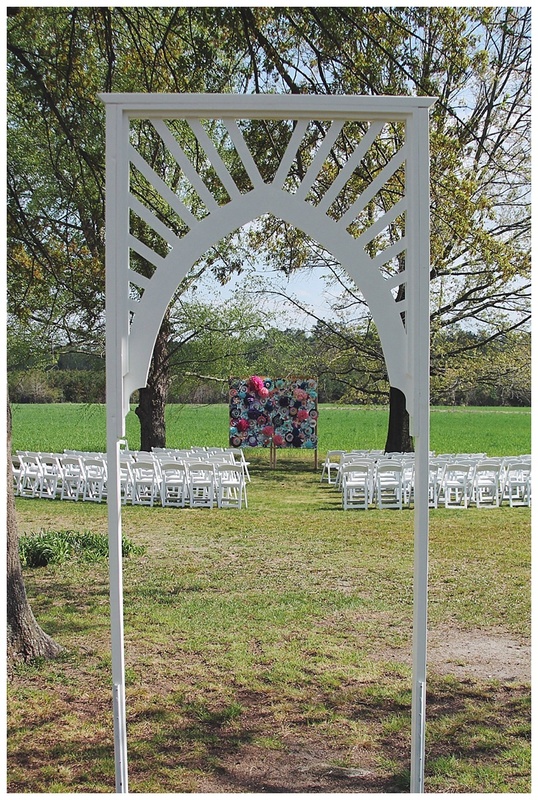 The ceremony and reception both took place on the bride's father's farm in Mardella Springs, MD. 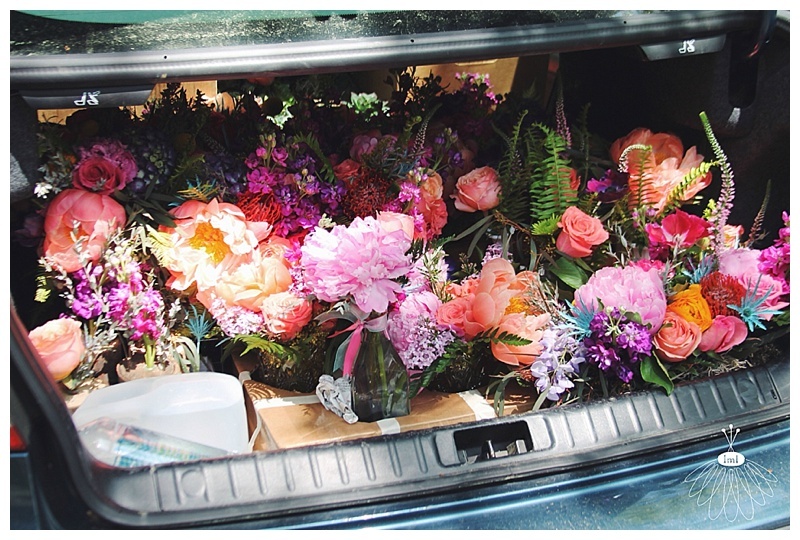 My car was bursting with flower arrangements on the drive there. The fragrance in my car was so satisfying. My mother (Who was the biggest help while setting up for this wedding! Thanks, Mom!) and I greatly enjoyed it. 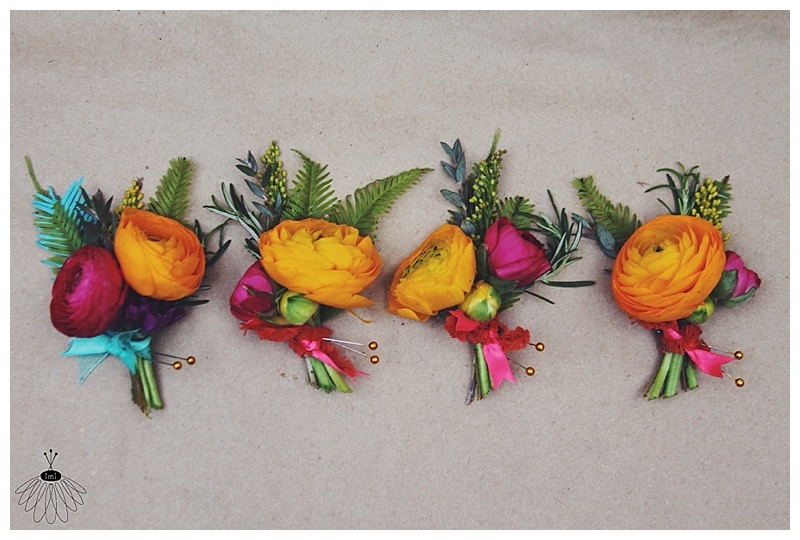 The groom's boutonniere had teal blue accent to match his bride while the groomsmen bouts had coral accents to match the bridesmaids. 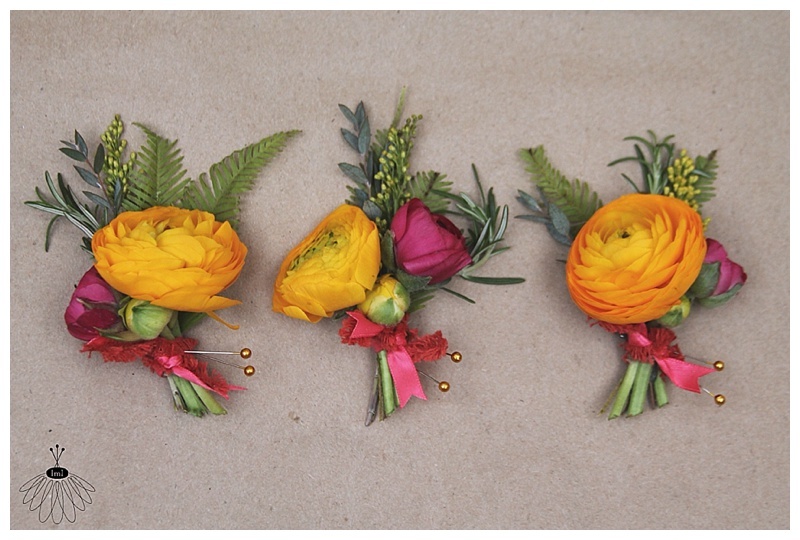 Groomsmen boutonnieres: yellow and pink ranunculus, a sprig of yellow solidago, ferns & rosemary. 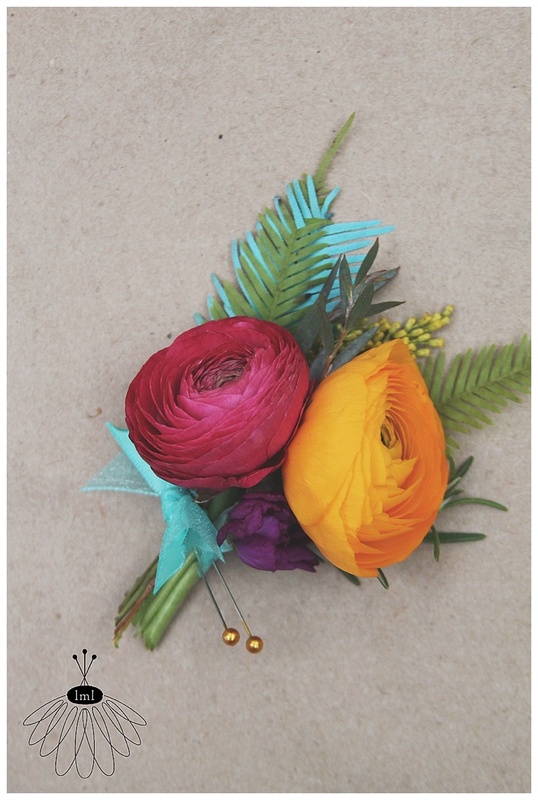 The groom's bout: teal accents with a yellow and pink ranunculus and purple stock. 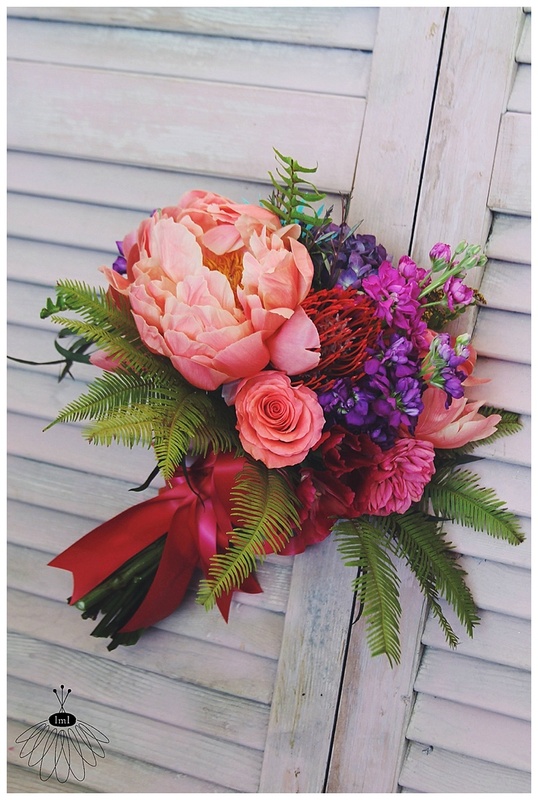 The bride's bouquet: large, free-form, and filled with beautiful blooms. Tied with teal silk ribbons and a small locket accent buried underneath the ribbons. 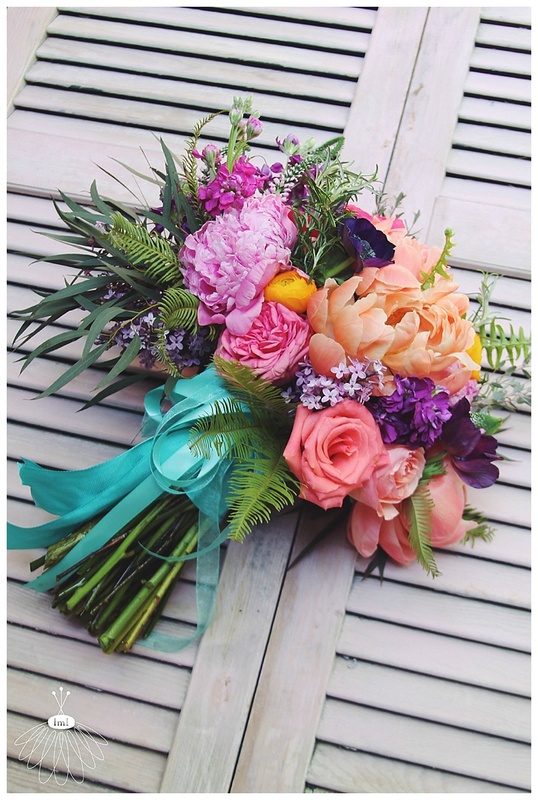 Bridesmaid bouquets: wrapped in coral and orange ribbon. 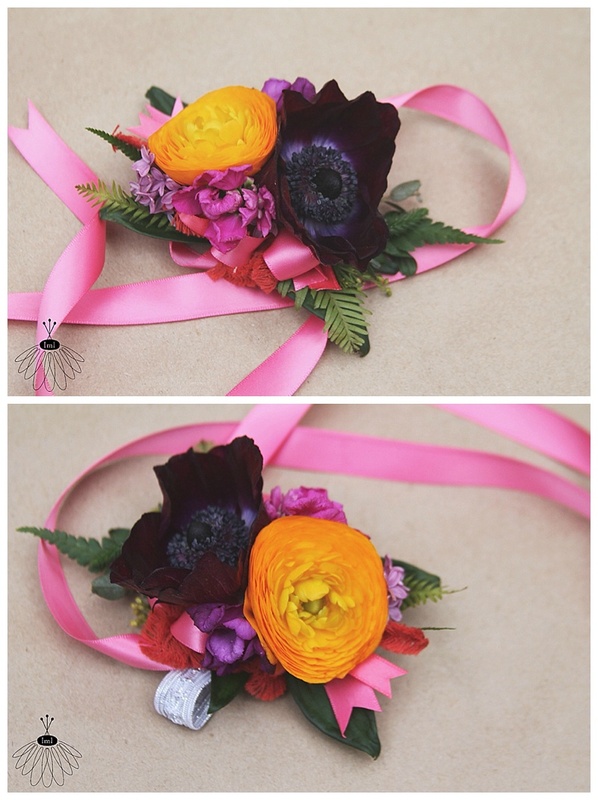 Father boutonniere: a purple anemone, pink ranunculus & yellow billy ball. 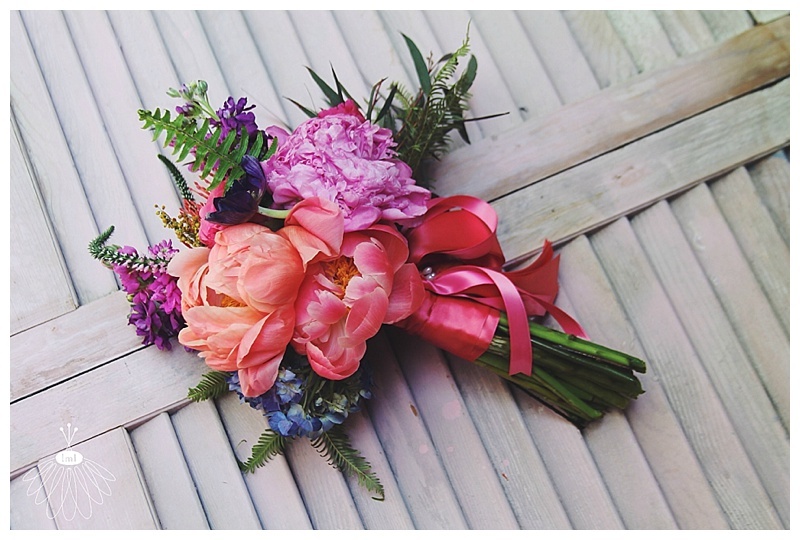 Grandmother pin corsage: purple lilac, a pink ranunculus & soft pink veronika. 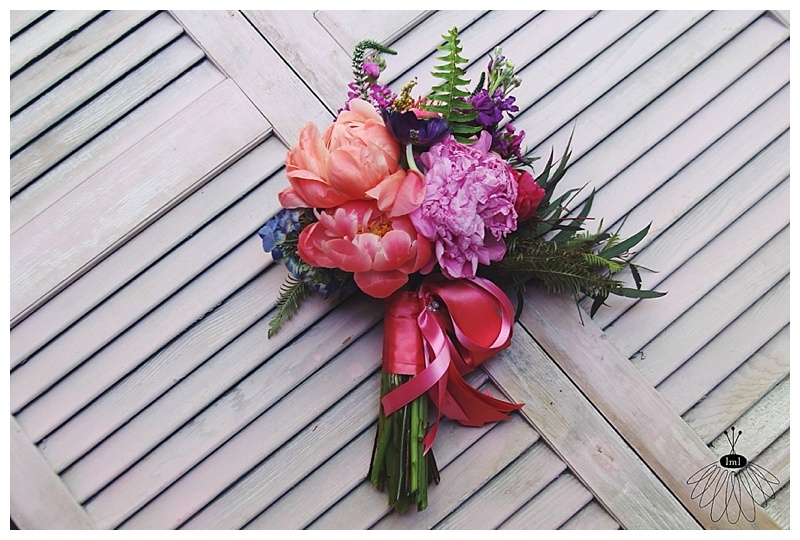 Mother's wrist corsage: pink ranunculus & purple anemone with a pink ribbon tie under the wrist. 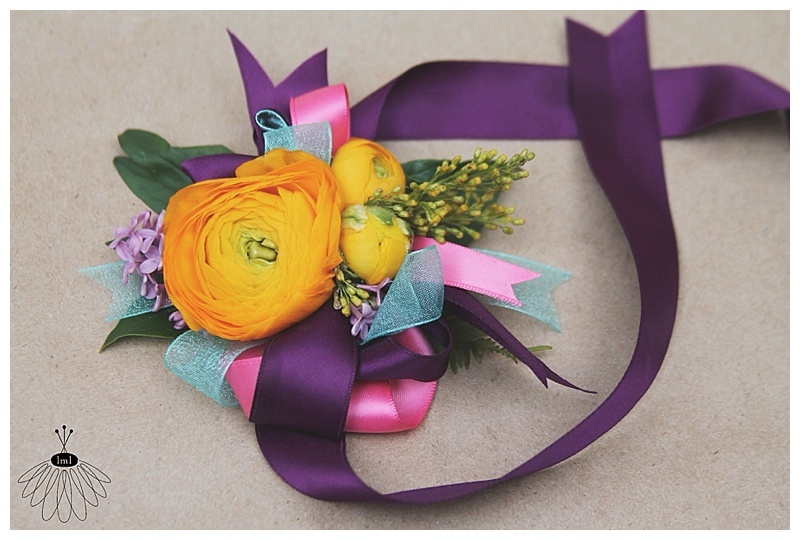 Mother's wrist corsage: yellow ranunculus & purple anemone with a pink ribbon tie under the wrist. 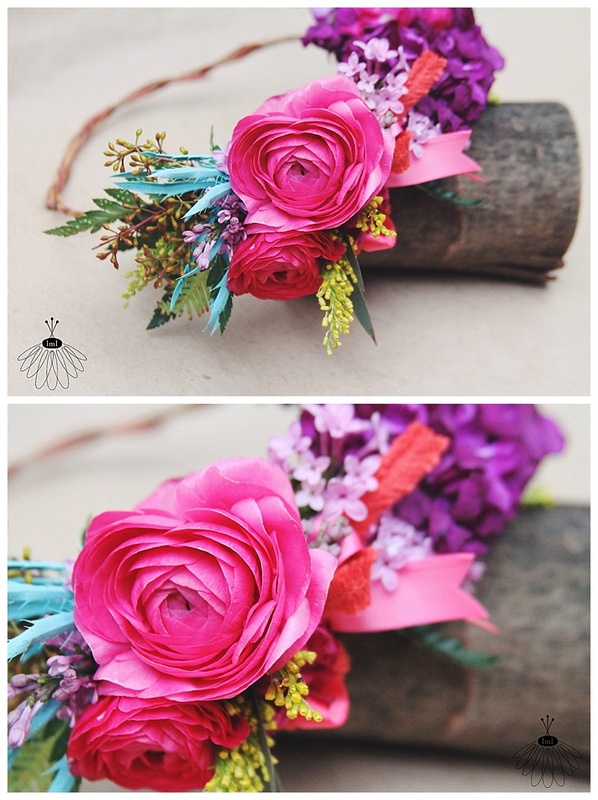 Flower crown for the flower girl. Details added to the flower girl's flower basket. Her basket was filled with dried lavendar. An accent for the yellow labrador's collar. 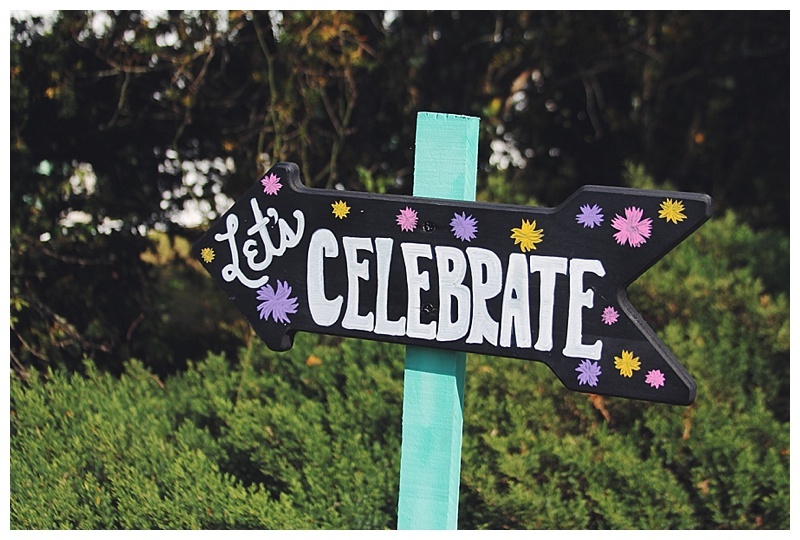 The bride & her friends created fun & colorful accents that were placed around the farm. What a work of art! 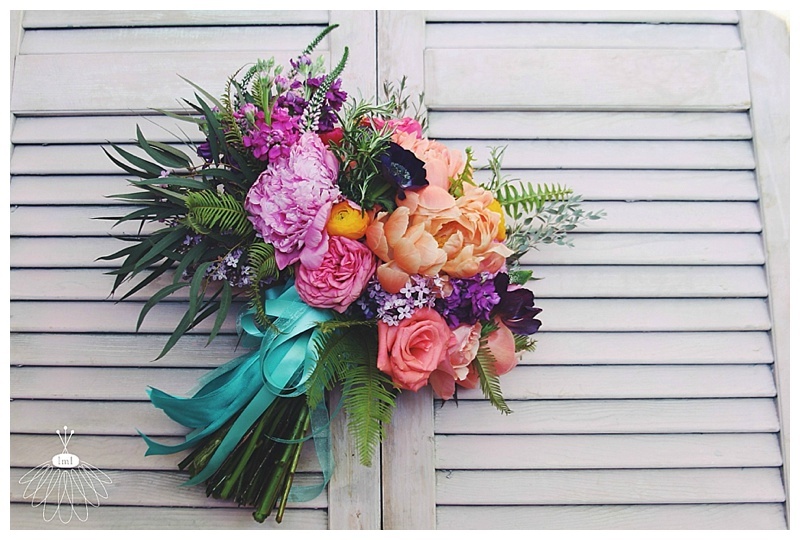 I pulled inspiration for the wedding flowers after seeing a photo of the backdrop the bride and her bridesmaids had created. Pinwheels and pom pons made out of scrapbook paper and tissue paper. 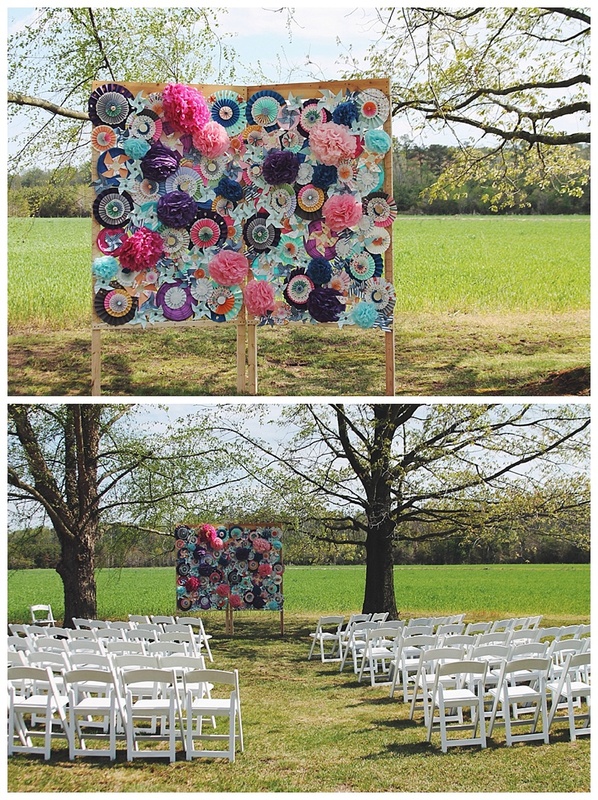 A gorgeous backdrop that looked fantastic with the similarly matched colors of the bridal bouquets. 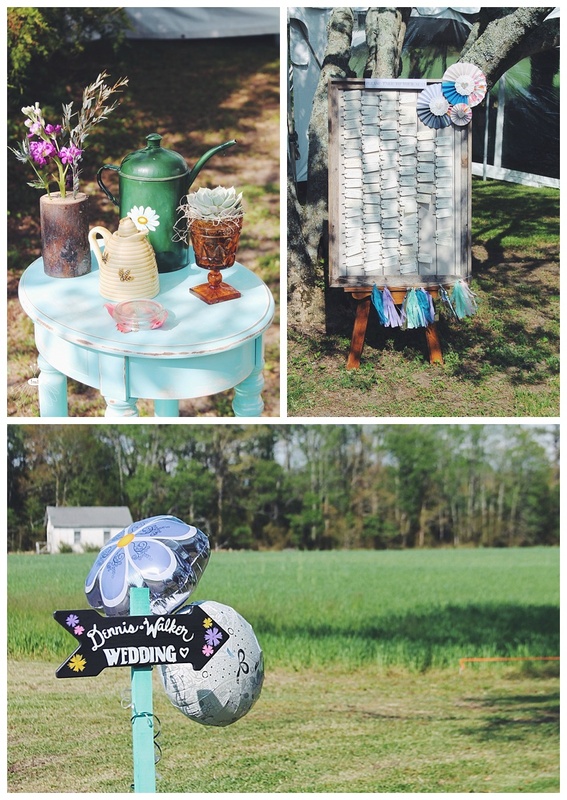 A few more accents placed around the farm and created by the bridal party. 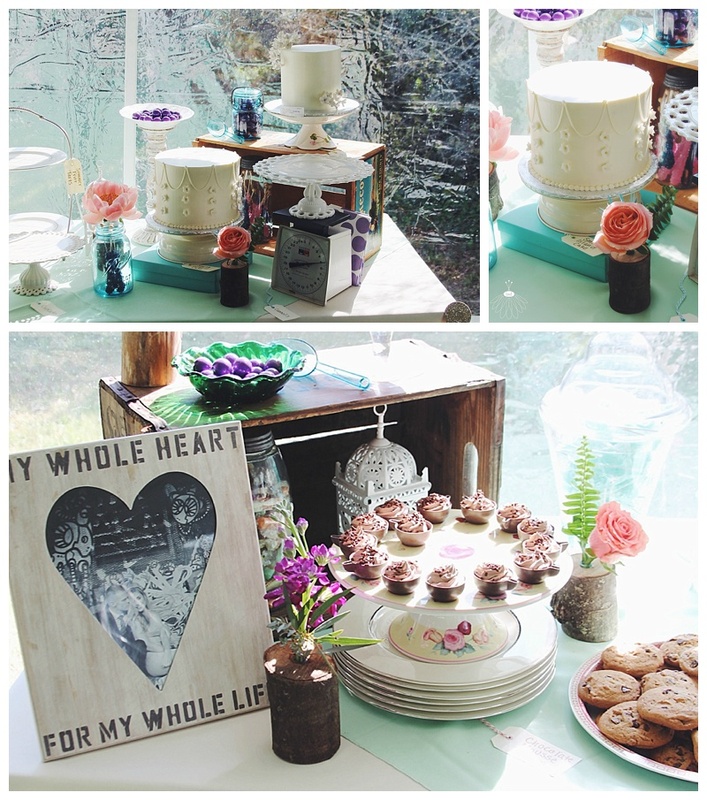 The small teal table was filled with items that belong to Julia's grandmother. A little cameo of flowers on the outdoor bar area. Love the little neon yellow hobnail vase filled with a cactus! Accents placed on the hors d'oeuvres table. English garden rose. 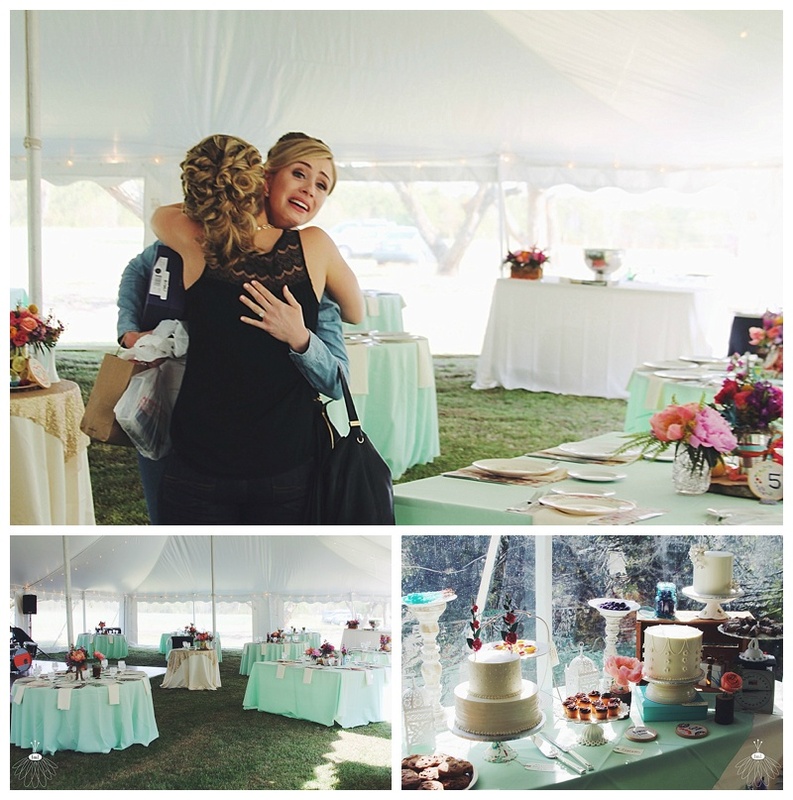 The inside of the reception tent looked like a dream-come-true. 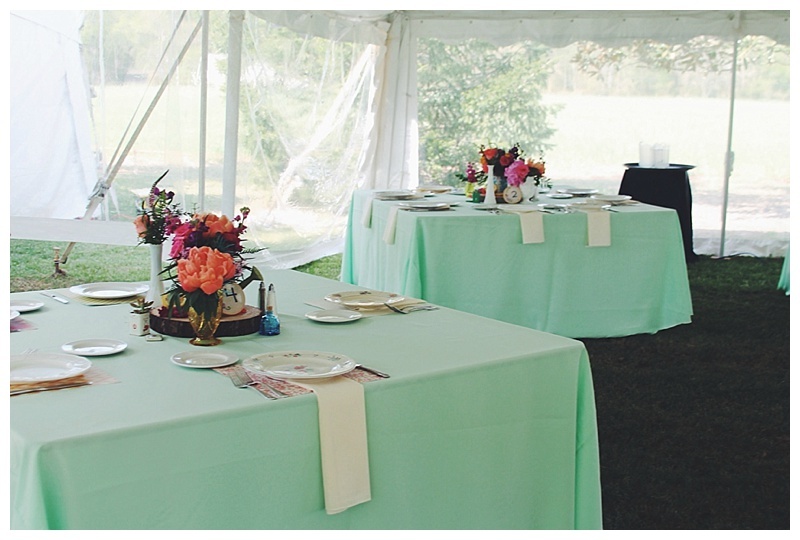 The minty linens were topped with mis-matched china plates. Sheets of scrapbook paper were used as placemats. 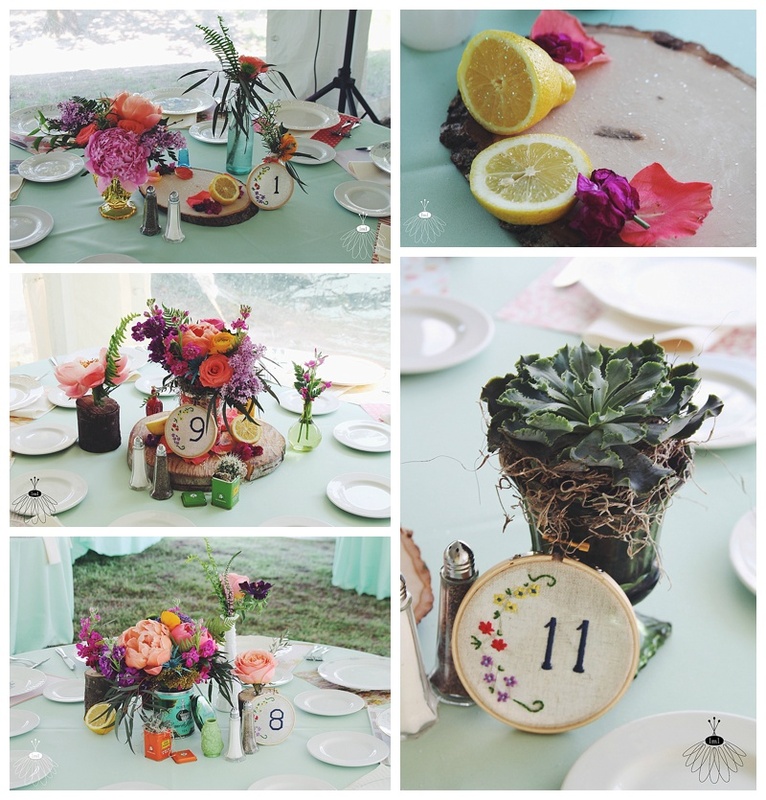 Each eclectic centerpiece featured a woodsy element, several cut glass vases, milk glass bud vases, tiny tea tins filled with succulents, a hand-embroidered table number created by the bride's sister, and colorful flowers like none you have ever seen before... OH! and lemons dipped in sparking glitter! 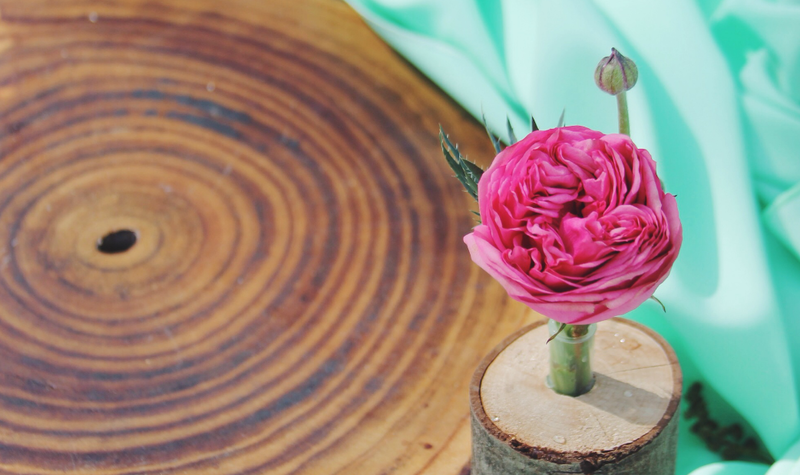 A few of the table centerpieces included the bridesmaid bouquets... a great way to save money while working on a budget and let your guests see the bouquets up close and personal, too! 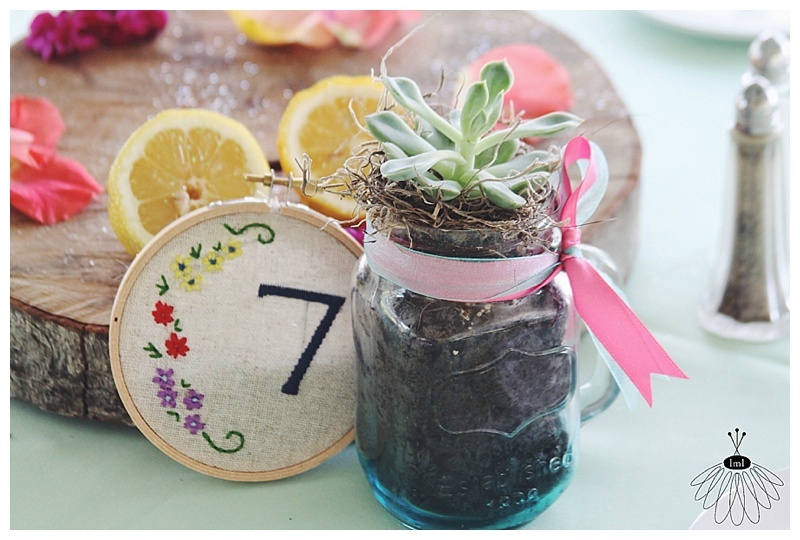 Succulents were planted in blue mason jars. 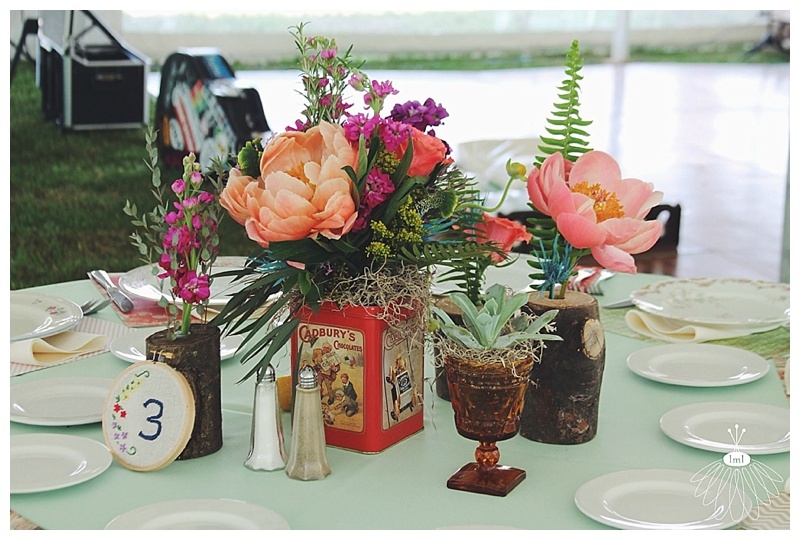 Tin watering cans filled with romantic blooms added a whimsical touch. The bride and groom's sweetheart table was covered in ivory linens and topped off with a sheath of gold sequins. 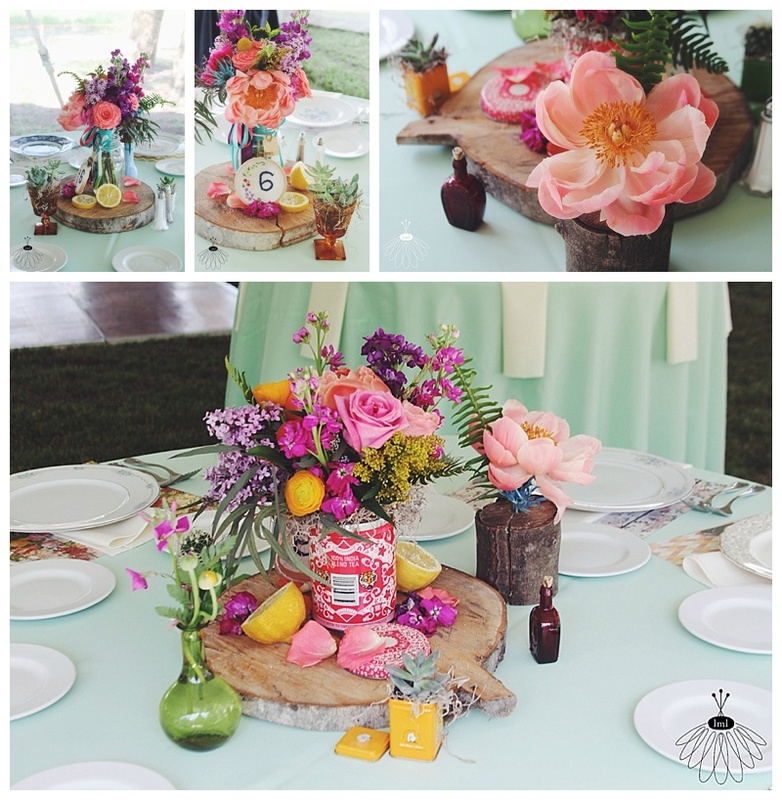 A few days after Julia had sent in her initial wedding consultation form, she had repined a lemon arrangement like this one that I had created for a farm dinner and shared on Pinterest. She wrote on the pin, "I LOVE this!!". After meeting Julia and hearing all about the details, I knew I had to include a lemon arrangement in her wedding somehow. 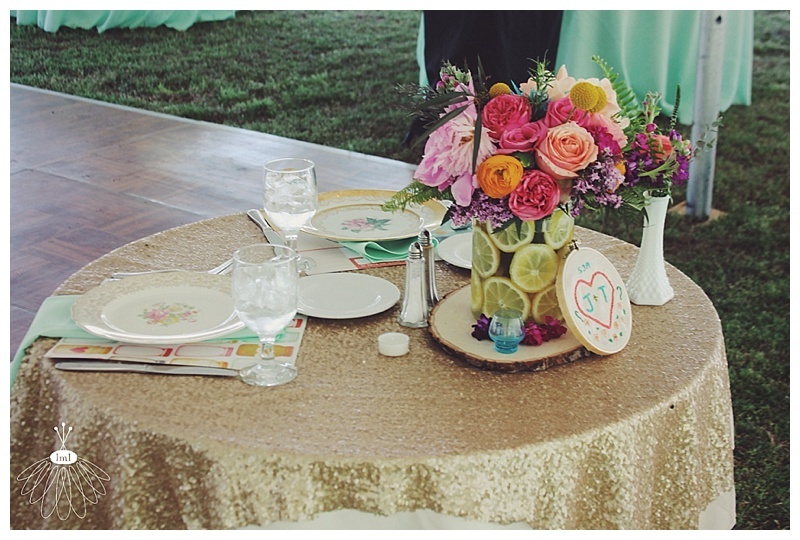 It made perfect sense to use slice lemons as a focal point on the bride and groom's table. I tied lemons into the rest of the centerpieces by placing sliced lemon halves covered in glitter on the wood slices under the arrangements. 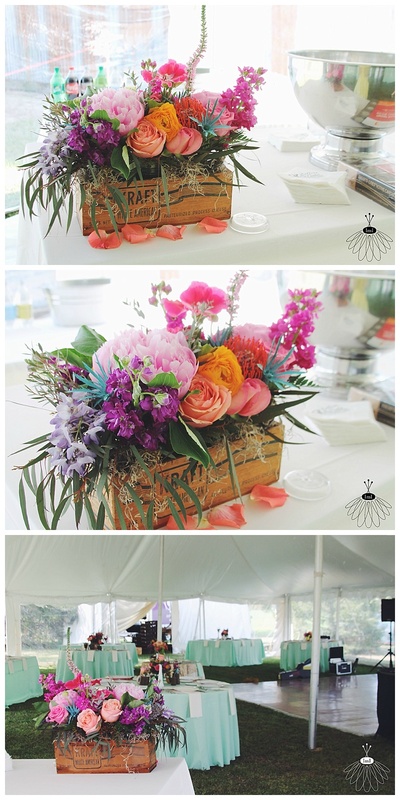 The bar inside of the tent featured a flower arrangement placed inside of an antique wooden Kraft American Cheese crate. So neat! Your the best! I teared up again! Lovely wedding! Thanks for letting me tag along! Hi Ami, Youir mom was tearing up telling me about this so I had to check out the photos. 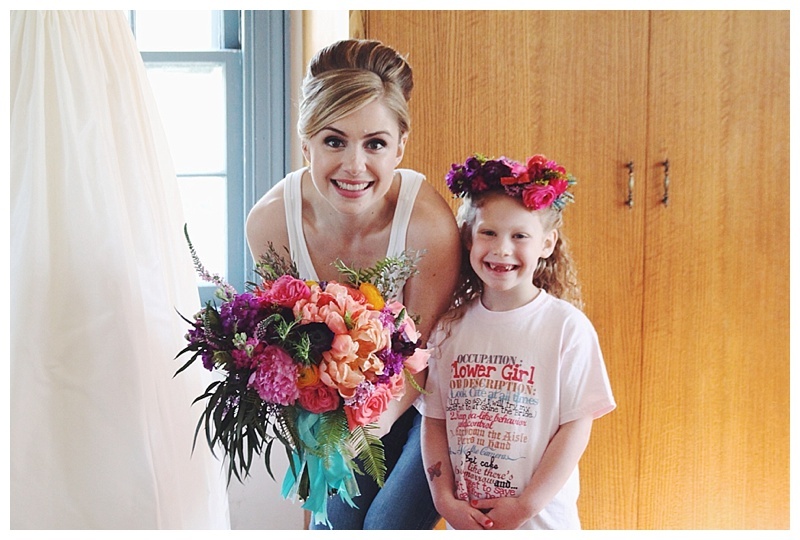 It was the brides dream come true and you did a wonderful job with the flowers!